Each week during the winter we will discover where people who actually live in Switzerland like to spend their winter days with their families. You’ll discover the best way to get there, which skiing abilities the area caters to, where to rent skis and which restaurants to try. And as the weeks go on, we won't forget the non-skiers either! Today we head into Graubünden with mum of 3, Gay. She previously shared her favourite local ski area, and today she is sharing with us what she calls a little Swiss secret, the resort of Sedrun. For ski holidays and long weekend skiing, we head to Sedrun in Canton Graubünden. We love Sedrun because it has everything we need for a week’s winter sport fun, it’s primarily frequented by locals so doesn’t have the big atmosphere of larger resorts down the valley, and because it’s incredibly beautiful. Sedrun is situated in the Surselva valley, which stretches from the well-known resorts of Flims/Laax in the east, to the top of the Oberalp pass in the west. The village is nestled against the upper reaches of the valley where the road starts to rise up the pass. The closure of the pass to road traffic in winter lends Sedrun an air of seclusion at this time of year, although the village remains accessible by car either via Chur (approx. 2.5 hours from Zug), or via Andermatt in combination with the car train (Gotthard Matterhorn Bahn). 3. What ability does the area cater to? Sedrun is now the easternmost entry point to the Ski-Arena skiing area, which stretches from the family-friendly slopes above Dieni (5 minutes by train or car from Sedrun village) to the extremes of black offered by the Gemstock high above Andermatt. Those new to skiing or snowboarding will feel very comfortable on the generous beginner slopes at Valtscheva, which – lying in the middle of Sedrun village – offer a safe practice space away from the main slopes. 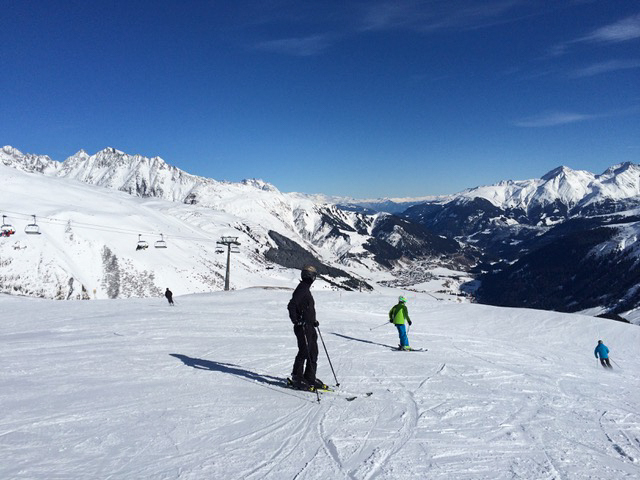 Sedrun has an active and popular ski school during the holidays. 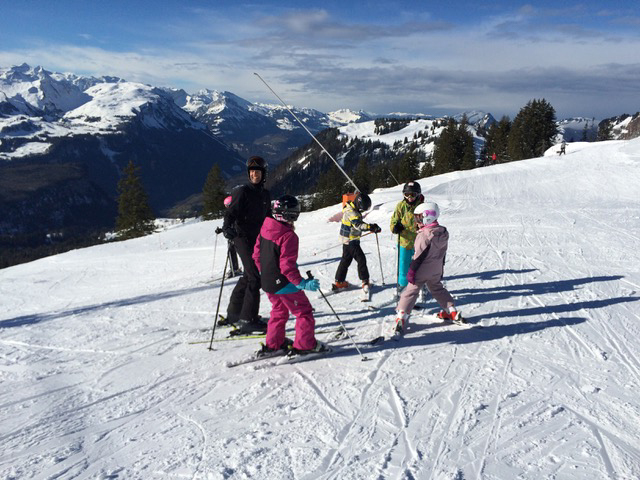 Week-long ski classes for the children are always full-day, and can include a supervised lunch, or not, as you prefer - many parents choose to meet with their children for lunch since they are themselves on the slopes. Snowboard classes are generally much smaller groups and run for half days only, with the beginner group run in the morning and the more advanced group heading up to the mountains in the afternoon. There is also ski-kindergarten for the very minis. Sedrun offers a range of activities for non skiers, including some amazing winter hikes and snow shoeing routes. Since it is a mountain area, it is always advisable to check on conditions and potential avalanche risk before setting out into unmarked areas. Langlaufers (classical and skaters) are also well catered for with prepared loipes, and there is an outdoor ice rink if the kids still have energy to burn off after skiing all day long. The Sedrun Guest Card – automatically issued to overnight visitors – provides reduced price access to the indoor swimming pool (Bogn Sedrun), free use of the Langlauf loipe, and various other specials. If you’re in Graubunden, you should try capuns (https://en.wikipedia.org/wiki/Capuns) at least once. Any “wild” (venison) on the menu will usually have been locally caught (ask to be sure) and will definitely be worth trying. There are several restaurants in the village, all of them good. For a treat (but not for vegetarians), stop in at the Metzgerei Churschellas and pick up some local cured sausages, dried meats or other delicacies of the area. Note that many restaurants in Sedrun still only accept cash! Despite its growing connection to Andermatt via the Ski-Arena project, Sedrun still remains largely undiscovered by the foreign and/or big-thrill-seeking crowd, while still providing a wide range of winter sport activities. We love the low-key, local feel of the town, the fact that we meet the same people there every year, and the fact that it’s small enough to retain a real sense of community. The phone number for the emergency services for the ski resort programmed in to my phone. This is usually printed on the piste map and is NOT the Rega number! We are a family of five (kids currently aged 11, 10 and 7), and enjoy being active. We got the kids into skiing as soon as we could, and it’s fair to say that I (mum) am now the official tortoise of the family when we’re on skis! Two out of three children are also keen snowboarders. Although I’m probably the least enthusiastic skier, I love to be out in the mountains and enjoy hiking, snowshoeing or trying to keep my balance on a langlauf loipe while the others try to break the sound barrier on the slopes. A big thanks to Gay for sharing with us not one but two great skiing recommendations. A place like Sedrun is exactly why I started this series, to find lesser known ski areas that have been tried, tested, and most importantly, enjoyed by families. Do you have a ski area you return to time after time that you would like to share with the Simple Family Travel community? It doesn't have to just be to ski - do you enjoy sledding? Snowshoeing? A spa?! We would love to hear you story. Get in contact!